I am going to cover the steps to configure and create the ASM disk group on Two node RAC cluster environment. Storage team will attach the raw disk on the node and handover to UNIX SA and SA will format, scan and label the disk, then handover to DBA team. 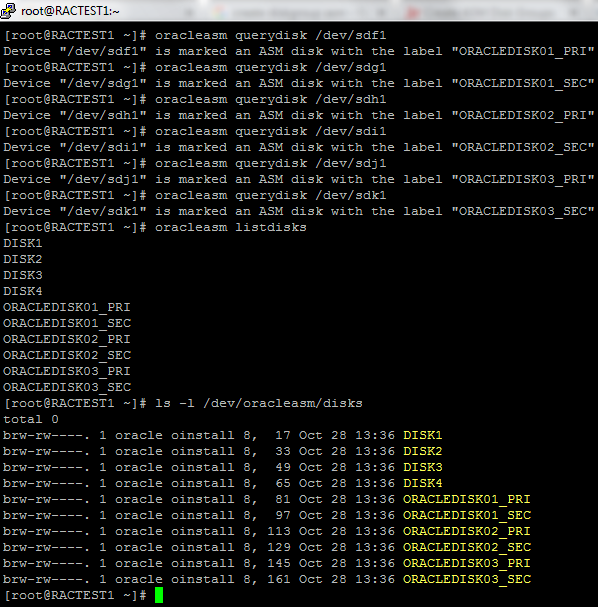 DBA will create the diskgroup on the ASM instance. 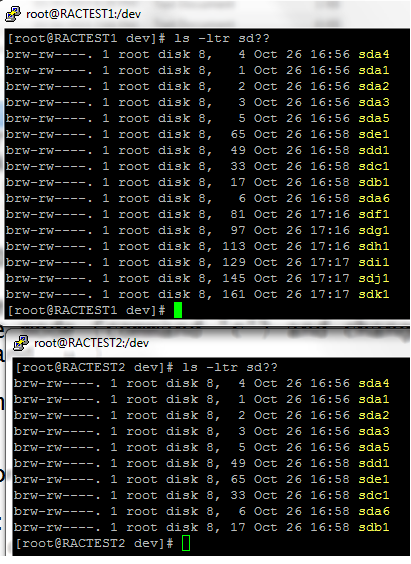 I am using Two node RAC and node names are RACTEST1 & RACTEST2. High level steps for adding disk. We are adding 6 disks on the server and names are as follows. Step 1 Storage team add raw disk on the server. 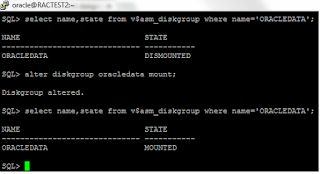 Storage team add the above 6 disk on the first node and make the disk shareable. 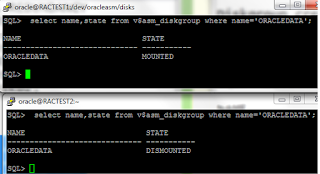 Then attach the above said disk on the second node. Now we can see the above disks on both the nodes. After adding the disk, the names will appear on server as below. 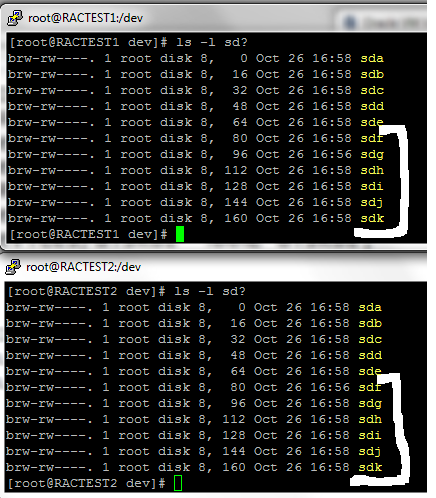 Login to RACTEST1 node and Partition the disk as below. Follow the below step for sdf, sdg, sdh,sdi,sdj & sdk. 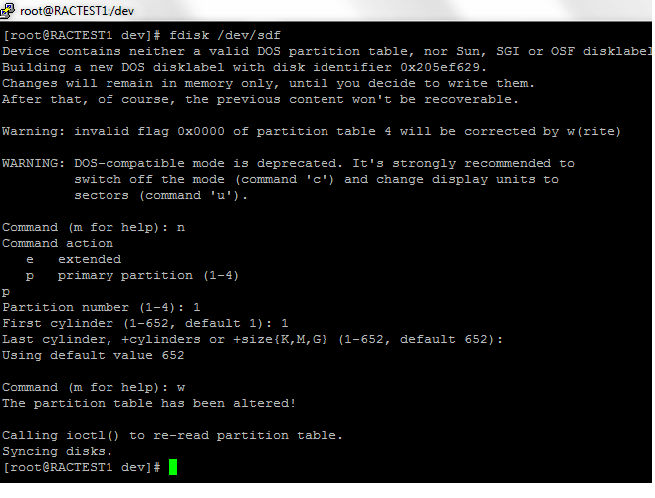 After formatting the disk, it will show on the server as below. 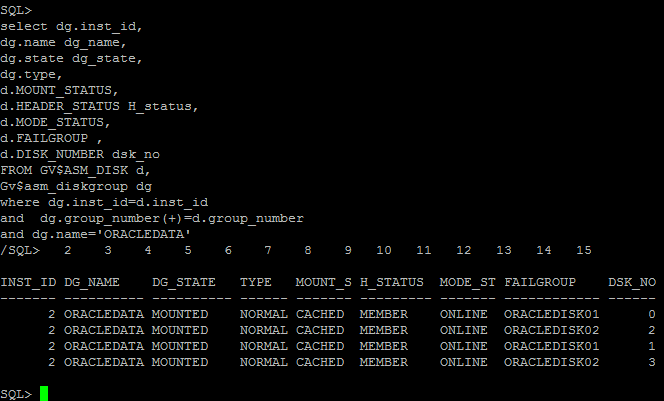 Now We can Query the disk on RACTEST1 as below. This is verification step to make sure the disk is created as we expected. 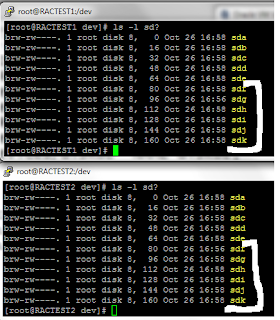 Step 5 Scan the above disk on RACTEST2 node. This disk will not appear on node2 unless we scan the disk on the second node. Here is the command to scan the disk. 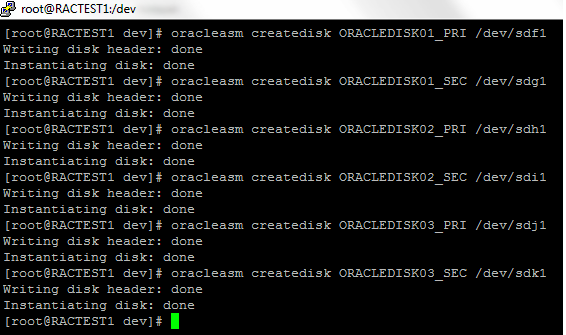 Step 6 Now the disk is ready to create in ASM instance. 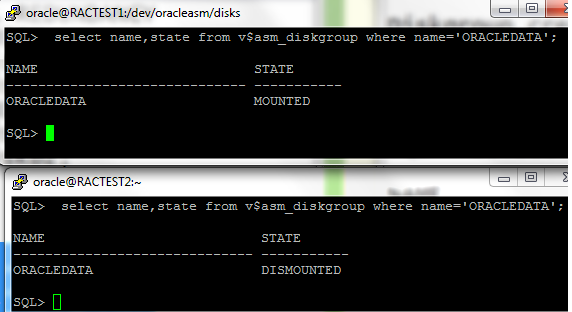 Here we are adding new disk group on ASM instance. 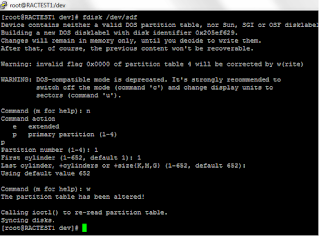 The above step failed, because, it is configured using asmlib. 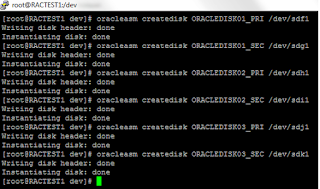 We will have to use UDEV for the above disk group creation command to be successful. Step 7 Now the diskgroup is successfully created. 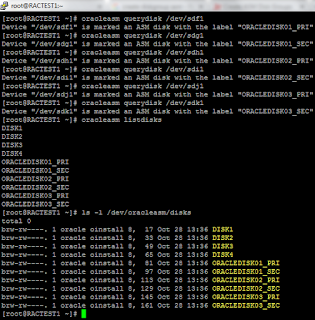 Let us verify the disk on the ASM instance. 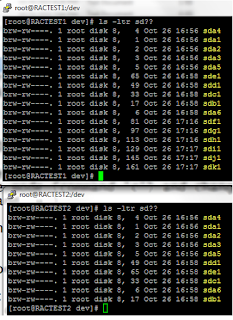 First let us check the disk status on both node. Oh.. 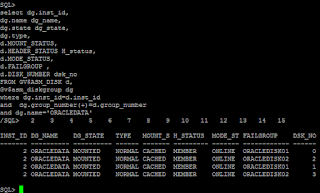 The disk group status shows DISMOUNTED on second node. Let us mount the database now. Now both node looks good. 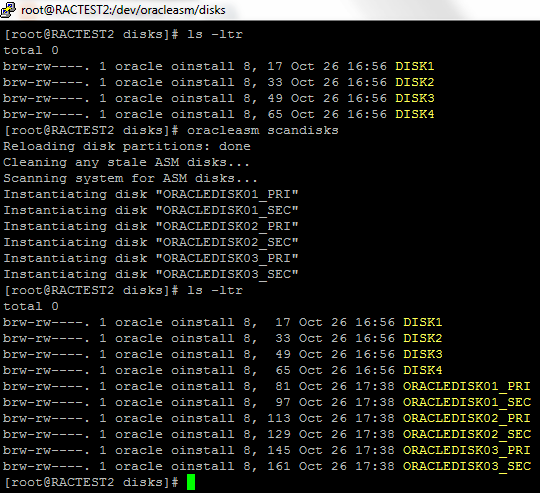 let us check the more info about the disk and diskgroup. Query to check the disk status info. Now we are done with creating the diskgroup. 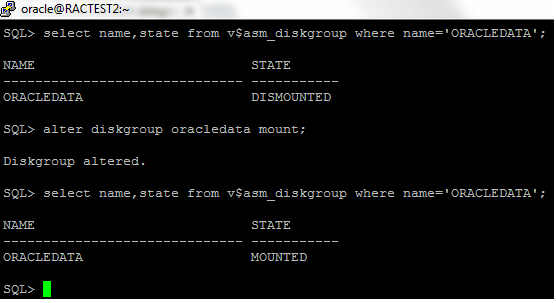 Now we can use the diskgroup for database!